Hublot King Power F1 "Austin"
As a young company, the Swiss watch manufacturer Hublot is focused on modern times. Their watches are a skillful combination of exceptional craftsmanship, numerous never-before-seen materials, and extraordinary designs. Hublot produces luxury watches with their own unique, personalized style and in-house calibers. The Swiss manufacturer was founded in 1980, making it relatively young in comparison to other watch brands. It should, therefore, come as no surprise that their designs range from modern to futuristic. "Hublot" is the French word for "porthole." These ship windows have been inspiring Hublot's designs from the very beginning. The Royal Oak from Audemars Piguet caused a stir in 1972 when they released a watch with a similar porthole design. While Hublot does produce watches with stainless steel cases, their use of unusual materials is what sets them apart from other manufacturers. For example, Hublot is the only company producing the yellow gold and ceramic alloy called Magic Gold . Some watches also feature carbon, sapphire, titanium, textile, and even a type of concrete. Most notably, their Big Bang model achieved cult status in a short amount of time. By Hublot standards, the Classic Fusion series is somewhat simpler, while the MP collection looks like something straight out of science fiction. The Spirit of Big Bang series distinguishes itself by its watches with tonneau cases. No matter what model you choose, buying a Hublot means taking a step off the beaten path. How much does a Hublot watch cost? Hublot offers more than 50 different models in its flagship Big Bang collection alone. The watches in this series tend to be a bit bulky and therefore slightly heavier. Most of the watches feature sapphire glass on both sides of their cases, which provides a glimpse of the elaborately decorated movement within. The Big Bang Unico series offers a large selection of watches with 45-mm or 42-mm cases. The 42-mm models have been available since spring 2018. The name "Unico" comes from its caliber: the in-house movement HUB1240 Unico. It consists of 330 individual hand-assembled pieces and is the result of four years of development. Furthermore, it was designed so that a variety of complications could be added. For example, certain Unico models can be fitted with a flyback chronograph, a GMT function, or a perpetual calendar. This has led to the development of special pieces like the Big Bang Unico Golf, which golfers can use to count holes and strokes. Depending on the complications and materials, prices for a Big Bang Unico range from 11,800 USD all the way up to 118,000 USD. Big Bang models from the Ferrari Unico collection are especially sought-after. Hublot has had a close relationship with the Italian sports car manufacturer since 2011, which shows in the design of these watches. They also come in a number of materials, including carbon, titanium, ceramic, and Hublot's own gold alloys Magic Gold and King Gold. Prices for a Ferrari Unico range from 13,000 to 41,000 USD. Unlike watches in the Big Bang Unico collection, those in the Big Bang Meca-10 and Big Bang Tourbillon Power Reserve 5 Days collections use manually-wound calibers. While the Tourbillon's caliber HUB6016 has a substantial five-day power reserve, the power reserve of the Meca caliber 1201 comes in at an even more impressive ten days. Both come with a power reserve display that indicates when the movement needs to be wound. The Meca-10 is available in ceramic, titanium, King Gold, or Magic Gold. Prices sit between approximately 15,000 and 35,000 USD. Hublot added cases made of sapphire glass and studded with diamonds to the Tourbillon Power Reserve 5 Days series in spring 2018. These timepieces demand anywhere from 58,000 to 95,000 USD. Other interesting models in the Big Bang collection include the Sang Bleu and the MP-11. The Sang Bleu was designed by Swiss tattoo artist Maxime Büchi, who is famous for his geometric designs. For the Big Bang Sang Bleu, Büchi replaced the typical hands with three overlapping polygons. This special timepiece ranges from 39 to 45 mm in diameter. Smaller models feature diamond or sapphire crystal embellishments. One of these watches costs between 18,000 and 38,000 USD. Hublot outfitted the Big Bang MP-11 with their in-house, manually-wound caliber HUB9011. Thanks to its seven barrels, this movement boasts an enormous 14-day power reserve . Before the release of this watch, the technology had been reserved exclusively for the MP collection. This innovation is now available in a Big Bang with a price tag of 70,500 USD. Standard models in the Big Bang collection measure in at 38, 39, 41, and 44 mm. Due to their more traditional dials and lack of skeletonization, they feel significantly more reserved than their sister models. There are three-hand models as well as chronographs, models with diamonds, and quartz-powered watches. Like the other Big Bang models, Hublot uses a wide variety of materials in their standard collection: from stainless steel to ceramic, all the way to various gold editions. These timepieces can cost as little as 7,100 USD and as much as 77,000 USD. If you think the Big Bang's design is unique, the MP collection goes even further. It's perfect for the eccentric watch lover, and the MP-05 watch looks like something straight out of a secret project in a laboratory. The case is pear-shaped, measures 46 mm in diameter, and is available in either titanium or polished sapphire crystal. Instead of hands, the MP-05 utilizes multiple cylinders with numbers on them. The power reserve indicator is located on the right, while the hours and minutes are on the left. The seconds display is located below them, and the manual winding caliber with its vertical tourbillon is visible in the middle. The truly eye-catching part of this watch, however, is its row of 11 barrels – most watches only have one or two barrels. The number of barrels in a timepiece is closely tied to the length of its power reserve. Thus, the MP-05 can run for 50 days before it needs to be rewound, an impressive feat for a wristwatch. One of these extraordinary timepieces costs an equally extraordinary 470,000 USD. The MP-07 and MP-09 are just as futuristic as their sister model, the MP-05. Hublot once again took inspiration from motorsport for the design of the MP-07, whose highlight is its row of nine barrels that provide it with its 40-day power reserve. Prices for this rather masculine watch begin around 235,000 USD. Compared to the MP-05 and the MP-07, the MP-09 feels almost classic. However, from a technological perspective, it is no less impressive. Its bi-axis tourbillon , which rotates on two axes, is particularly hard to ignore. This timepiece comes in carbon or titanium and is also available with precious gemstone embellishments. Plan on spending at least 135,000 USD to purchase an MP-09. The Techframe is also a part of the MP collection and was designed by Ferrari's Chief Designer, Flavio Manzoni. This one-pusher chronograph with a tourbillon not only has a skeletonized dial, but also a skeletonized case. In addition to titanium and carbon, this timepiece comes in white gold or shimmering King Gold. Depending on the material, one of these masterpieces costs between 104,000 and 128,000 USD. The Classic Fusion series offers more conventional designs compared to the MP series. Three-hand models with a central seconds and date display come in four sizes: 45, 42, 38, and 33 mm. By Hublot standards, these variants of the Classic Fusion are downright simplistic. Its distinguishing element is its bezel, held in place by six decorative screws. Other versions include a chronograph caliber, moon phase indicator, or power reserve indicator. The Ultra-Thin models feature the same case as the Classic Fusion models, but are extra flat. The Classic Fusion with a minute repeater and tourbillon is just as technically sound. What's more, this collection offers an assortment of interesting materials. For example, Italian Independent models have dials and bands made of the kind of textile used in suit making, while the Classic Fusion Berluti features leather dials and bands. Prices in this collection range from 3,400 USD for simple, quartz-powered models to well above 235,000 USD for diamond-studded editions. The Spirit of Big Bang can be considered a tonneau offshoot of the Big Bang series. The 42 and 45-mm chronograph versions are powered by the caliber HUB4700, a modified Zenith El Primero. This movement has a 50-hour power reserve and can be viewed through the intricately skeletonized dial. The case of the 42-mm Spirit Moonphase houses the caliber 1770, which provides this timepiece with its moon phase and outsize date displays. Be sure to have around 18,800 USD on hand for a Spirit of Big Bang. Design wise, the King Power collection is quite similar to the Big Bang, though it is no longer in Hublot's catalog. It is somewhat more angular than the Big Bang and also comes in ceramic, King Gold, or titanium. The variety of movements and complications is equally diverse. These timepieces cost anywhere between 11,800 and 29,400 USD. Limited editions created by Hublot in collaboration with big names from the world of sports and entertainment are true collector's items. The list of brand ambassadors includes many familiar names, such as Usain Bolt, Pelé, Dwayne Wade, Floyd Mayweather, Bar Refaeli, Lang Lang, and Depeche Mode. Each of these watches is a result of close cooperation with the respective celebrity, and some only come in extremely limited numbers. In the case of the Depeche Mode watch, you can even support a good cause with your purchase. All of its proceeds go toward the "charity: water" project, which has provided clean drinking water to over 30,000 people in Nepal and Ethiopia. If you'd like to call one of these unique, limited edition watches your own, be sure to have between 11,800 and 29,400 USD on hand. In addition to Formula 1, Hublot has a strong connection to the world's most popular sport: soccer. 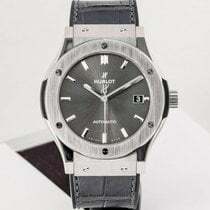 Hublot has been a sponsor and the official timekeeper of the UEFA Champions League, Europa League, European Football Championship, and the FIFA World Cup for years. Each major event sees the release of a special, limited edition timepiece. The most recent example is the Smartwatch Big Bang Referee made for the 2018 World Cup in Russia. However, Hublot is focused on more than just the big tournaments: They are also partnered with Juventus Turin, FC Bayern München, FC Chelsea, and Benfica Lissabon. Each team has their own special edition timepiece. One of these soccer watches costs between 12,900 and 23,500 USD. Hublot has been successfully experimenting with various case materials for many years. The company has made major contributions to the research of gold processing. This resulted in the creation of so-called "King Gold," among other materials. King Gold is made of 18-karat gold mixed with platinum and a high percentage of copper. The alloy doesn't oxidize and is characterized by its intense red color, which stays vibrant for years. Hublot is also venturing into uncharted territory with their Magic Gold. Unlike other gold alloys that are made by adding other metals, Magic Gold is a mixture of ceramic and liquid gold. The result is the world's first scratch-resistant 18-karat gold alloy. Hardness is measured in Vickers. The average 18-karat solid gold case is 400 Vickers. Tempered steel is 600 Vickers. Magic Gold, on the other hand, is almost 1,000 Vickers. This mix of gold and ceramic is so strong that a diamond is needed to work it. Hublot produces its watches in Nyon, a city near Geneva. Italian Carlo Crocco founded the company in 1980, and introduced the first ever wristwatch with a natural rubber strap at the watch trade show Baselworld. However, Crocco had been developing watches long before that: His first watch was designed back in 1967. In 2004, Jean-Claude Biver left Omega and became the CEO of Hublot. One year later, Hublot was the recipient of countless awards from the watchmaking industry for their then-new series, the Big Bang. In 2008, the luxury goods conglomerate LVMH Moët Hennessy Louis Vuitton SE bought Hublot from Carlo Crocco. TAG Heuer also belongs to LVMH. Ricardo Guadalupe has been at the head of Hublot since 2012, while Biver continues to serve in the background as Chairman of the Board of Directors. The two men had previously worked well together at Blancpain.